A different kind of Santa has come to town for this week's TTC busker profile, armed not with a sleigh and sack of toys, but two unusual instruments and a few tricks up his sleeve. 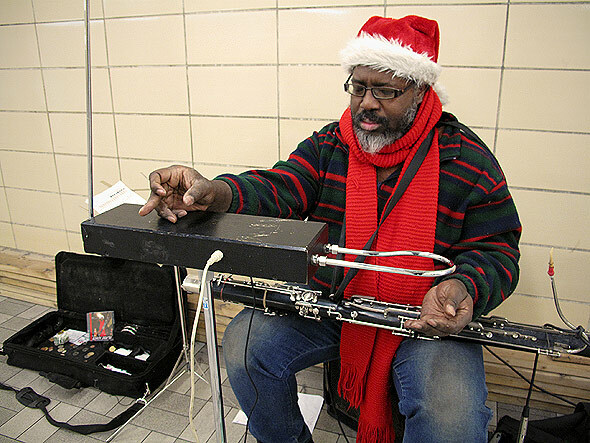 I watched with fascination as self-professed "Black Santa" Jeff Burke performed in the hallway leading to the bus platforms at Sheppard-Yonge. There was something irresistibly jovial about the way he puffed on his bassoon, and something eerily meditative about the way he closed his eyes with concentration, fingers twitching ever so slightly between the antennae of his theremin. Despite the frightful aboveground chill, I soon warmed up to Jeff, also known by his stage name, Bassooner or Later. It didn't take long to discover this Santa's special breed of holiday magic: a finely tuned ability to make anybody smile. Tell me a bit about yourself. Who is Jeff Burke, and what does he do? Well, Jeff is a bassoon player. I've been playing bassoon for 31 years now, and I played piano before that. I play with a couple of other groups, and the styles I play are very dependent on the group I'm with. Sometimes it's rock bands, sometimes folk bands. I've done stuff with singer-songwriters, I've played for dance classes...whatever will keep things going. TTC busking is my way of keeping things together. When and why did you start busking for the TTC? I've been busking in the subway for 20 years now, and I first got my license in '89. Well, with the exception of one year when I had a show in the U.S., and I got caught in a lineup coming back across the border. That year, I wasn't able to get back in time for the audition. That was the one year in that 20-year span that I didn't have a license, but every year that I've auditioned I've managed to get one. Early in my playing career, I had issues with stage fright. Someone suggested in a music camp that I spend a week playing in the backyard. It's a very strange sound because when you play outside, it sometimes sounds emptier than you'd expect. Then I tried playing in empty sidewalks, and as I got more comfortable, in busier and busier areas. People gave me a lot of positive feedback, so I kept doing it. I've done it ever since. How long have you been playing the theremin? I got it working around the beginning of July and had the gall to bring it out for an improvised modern dance show shortly after. I thought it'd work rather well, and it did. Then I put it on hold for a bit, before taking it out to a couple other shows, and eventually underground. I've been bringing it out every night now, and getting good results. How often do people stop to ask you what that strange instrument is? It happens quite frequently. I've only started bringing the theremin out recently, but I normally get people stopping for the bassoon. I've gotten, "It's that a didgeridoo?" Sometimes you get more outrageous comments. I once had someone ask me if it was a glockenspiel. They didn't recognize the instrument so they picked the strangest name they could remember. It's funny though, there are a lot of people who do recognize the theremin. It's an old electronic instrument, but it's not one that you see out there every day. People will recognize the sound from movies, or from a Beach Boys song. Are there any other theremin players on the subway? I'm the only subway bassoonist and the only subway thereminist. I'm very good at being weird. What would you say is your genre? My genre is no genre at all. It's very much an effort to be able to mix, match, and cross. I've been trying to expand my repertoire so that I always have something at my fingertips that will make somebody smile. Whether that something needs to be a jazz tune, an Irish tune, Zeppelin or Metallica, hip hop, funk, or blues, I'll play it. Sometimes, people make requests. I can often pull off requests cold. If someone has a song I've never heard on their iPod that I can listen to first, I can start playing it back to them. The bassoon is a lovely instrument with a 400-year history, but it's mostly known for its classical repertoire. People don't often think of its other possibilities. There's a certain power in knowing that I can do almost anything musically, once I wrap my mind around it. What are your most popular songs? On a day-to-day basis, some of the songs that have the most impact are the Numa Numa song (Dragostea Din Tei by O-Zone), Kashmir by Led Zeppelin, Crazy Train by Ozzy Osbourne, Creep by Radiohead, I'm Yours by Jason Mraz, With or Without You by U2, and Zombie by the Cranberries. I have 100-odd songs ready to go at any given moment; its my semi-official repertoire. Can you tell me a bit about your album, Black Santa? A couple years ago I was doing some work with a hip hop group called the Dope Poet Society. They were experimenting with using live performers along with prerecorded beats. They gave me some studio time, and I had a couple of originals in my head I'd worked up on the subway, and a couple of Christmas carols I'd twisted around and reinvented to make them interesting. While playing around with Paranoid by Black Sabbath, I noticed that the chord changes matched up nicely with God Rest Ye Merry Gentlemen, so I kind of did a mashup of the two. The idea for Black Santa kind of grew from there. It made people smile. I'm always for things that make people smile. Keith Jarrett is a very, very big influence for me. Miles Davis is another one. Mostly jazz artists; they're the ones that have been uppermost in my mind with the stuff I've done over the years. Also Charlie Parker, and Thelonius Monk. They all have unique ways of approaching some of the aspects of playing I've taken to heart. What's the most fulfilling thing about your busking? The TTC audience shifts all the time, but very frequently people who remember me from say, 20 years ago will run into me. It does seem to lead to a flavour of recognition that's kind of neat. There are times when you're playing when you do feel kind of anonymous, but you get these reminders that you're definitely noticed and remembered. I find it rewarding time after time. I spend time with my daughter when she's not in school. I'm often rehearsing with other groups. I mess around on the computer. A lot of the time when I'm not playing, I'm reworking a song in my head and planning what to play next time. There's a lot of thinking about music. What's the name of the device you use to loop and layer your playing, and where did you get the idea to use one? The one I'm using is a Line 6 Delay Modeler. It has 14 different types of echo, delay, and reverb effects, and one of the effects it has is the loop, which gives you up to 28 seconds of a single musical loop. One of the games in my head as I'm listening to music is, "Can this be reorganized so that it can be played with that limitation?" I get ideas all the time. Sometimes you can describe on the fly what you have in your head, but often you just need to be able to play it. I was looking for some way to be able to hear an idea, play it, and then immediately start to interact with it. The pedal's limitations require me to be creating, playing, and interacting in a way that's more organic than simply playing against a karaoke track, so to speak. You can see me go from silence to an orchestration, in some cases. What's the most the interesting thing you've had dropped into your instrument case while you were busking? There are a couple of candidates. I've had the odd bottle of beer put in, which is funny because I don't drink. I've had phone numbers. I've had something green and leafy show up, which, again, I don't have any use for. I've had a $100 bill put in the case -- that one just sort of blew my mind. I was playing one of the tracks on my CD, and this woman stopped and said, "That's so beautiful. Wait a second." She opened an envelope, pulled out a five, and put it back. Then she pulled out a 20, and put it back. When she finally found what she was looking for, she put the money in the case and walked off. I looked in my case, and was absolutely flabbergasted. While I'm playing, people who used to play the bassoon will run into me, telling me they stopped because they had other things to do with their lives. Other people will give me this wistful look and tell me they miss making music. Someone once said to me they weren't good enough, and that they weren't going to be a professional so they thought they shouldn't waste their time. It's always sad to hear about people letting music go because they think they aren't going to be good enough. To me, doing creative things with music doesn't have to be about being the virtuoso or the expert. It's something you have fun with that opens up your heart and your spirit, and you can share it with people one way or another. I want people to give their spirit a chance to breathe, and do some of those things. While they may not make you money, they can make you happy, and you have to find some way in your life to squeeze those things in. It enriches your life. Watch Jeff play his own special holiday mashup, with a little of Nirvana's Smells Like Teen Spirit, below.